For the fall of 2015 we had deer tags (only). Don’t get me wrong, it was our second choice, and I certainly was grateful for the opportunity of pursuit. “Vorfreude” followed, the planning, studying of maps, scheduling vacation days, talking to others who had hunted there in years prior. Also drawing from my own experiences in unit 20B. Add to all that two scouting trips. Eventually the day came to put it all into action, pack the Toyota, gas up, and head for the hills. This time Ron and I had help. Rob, without a tag, accompanied us the first two days, armed with a tripod-mounted Docter 15x60 pair of binoculars. His approach is to let the eyes do the walking. On opening morning Ron stayed with him, while I decided on the bird dogging method of covering plenty of country. OK, not like I used to, neither in speed nor distance. Age, and hopefully some wisdom, has its effects. But I was on the move for most of that day, going at least twice as far away from Rob’s truck as those two, and away from any roads. By the end of that day I had seen … nothing, no deer, no pigs, nothing bigger than a jack rabbit. At one time there was a very steep hill to get to the bottom of. Either that, or go back the same route. It was on that hill when I sort of made the decision to change hunting from ‘hard to ‘smart’, at least more of it. Ron and Rob on the other hand had spotted deer within ten minutes of us separating. Advantage Docter. As is often the case, none of those deer had head gear. Worse, those two had also seen way too many road lice near their positions. Putt-putts, or rather ATVs and side-by-sides, “patrolled” the roads for most of that day, along with an occasional truck. So, no horns on opening day. For day two I suggested a different canyon. Closer to camp, featuring less vegetation but also no road close by. With Rob in the lead we would stop often so he could cover the country with his optics. It was quite windy that morning. About an hour into the hunt we saw a doe. She was on a hill above us, within range, did not flee. But no other deer emerged. We pressed on. Carefully rounding a side hill, nothing showed on the opposite slope. I suggested flinging a rock downhill. Rob agreed. That rock was good ‘n loud on impact. Enough that some two hundred steps away three very nervous deer bolted out of the bottom. Rob announced “no horns”. Then two more followed, and my pulse quickened. But the 15x each time confirmed “doe”. And another two. No buck. We watched them carefully, saw them settle down one hill over. Still no buck had joined them. We completed our path around the bend. A beautiful view of the rest of this mountain greeted us. I whispered to Rob, “If there is no buck up there we ought to quit and go to Lake Pleasant to fish.” He again put his binos to work. With my 10 power binos I detected no obvious deer. It didn’t take Rob long before he turned and told us that he had found a buck up there. No monster, most likely a forked horn. Once I’d seen him through those Docters, I could also see him with my 10X, out there in the shade, and that he had antlers. The agreement had been all along that Ron would take the shot in such situation. I sat down, rifle ready with elbows on my knees for backup in case something would go wrong. Things would go very wrong! Problem #1 – Ron could not find that deer in his scope. Meanwhile Rob had ranged him at 220 yds. As the precious minutes ticked away, I became just a little anxious. 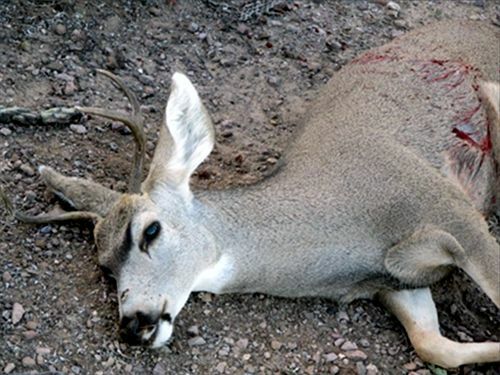 Problem #2 – After more than five minutes the buck had enough of our theatrics and began to move. The crest wasn’t overly far away, so as soon as he stopped again, I fired. Problem #3 – I missed. #4 – Also with each follow-up shot. Blowing it big is no fun for boys like us. In front of an audience, and possible taking an opportunity from Ron really gnawed on me for the rest of that day. And flashbacks came the following days as well. Rob had to leave that day. Ron would not see another deer on this hunt. I briefly saw two Sunday morning, maybe three hundred paces off, neither a big buck. We quit Monday near noon, again without seeing any deer, but with the plan to try one more time coming Thursday. Then work prevented Ron from going. So I was alone when I exited the 4Runner at absolutely first light, now off Table Mesa Rd, not even thirty miles from my house. However, something was different. At least in part learning the lessons from that 15x Docter, some experimenting with my binoculars and walking stick Tuesday evening in my back yard proved to me that I can scan terrain a lot better, a lot more controlled by resting the binos on the top of that stick. Therefore I remained at my vehicle for many minutes, scanning in all directions, and that several times. Only after no deer showed did I move, to the saddle I had decided on while studying the maps again. From there a repeat of the glassing procedure followed. Due to the wind, beginning in the bottom below my position, it did not even take two minutes and the outline of a deer materialized in the Kahles binoculars. The doe was where I suspected, trying to defeat the wind. There must be others! A little more searching found the next one. Except this deer was staring right back at me. Luckily there was considerable distance between us. In the still prevailing morning dawn I guessed approximately three hundred steps, but low light always makes distance appear further. It must have seen me as I crested, against the brightening eastern sky. I hated myself for not crossing over more carefully. My pulse quickened some as this stare-down continued. It was no big buck, and not enough light yet to detect spikes, possibly. I became more nervous when I realized that the wind was coming from behind, blowing almost at them, but not quite. I hoped it would not shift, and did not move an inch, except gently twisting the binos atop that walking stick. Eventually two more deer came into view. Again, no obvious antlers rising above ears, but one looked different, ears clearly spread further. Most likely a buck. The minutes ticked away. Finally the staring ended, all four were now slowly feeding about, barely changing location. And when they did, almost towards me … and behind a big tree between us. Then the next moment they were completely out of sight, behind bushes down there where the wind had less effect on them. Meanwhile I prepared. First the cross sticks came carefully off my walking stick – I now like to call it ‘multi-tool’. Next was fishing the rangefinder out of some pocket. Readings to where they had been came out to 250, an opening to my left at 180, another to the right at 240. The deer reappeared, drifting right, still that tree between us. Now it looked like that one deer had spikes. I inserted ear plugs, which turned off the wind noise, and decided to go into the sitting position. That really obstructed the view to the critters. So I very slowly crab-moved to my right. Many long moments later one deer was in that 240 yard opening. Pulse quickened again as I placed the Tikka onto the cross sticks. With scope cranked to 9x, again no horns. I switched back to the binos, now only supported in my hands, with elbows on my knees. Oh, right behind that doe there came a buck. Daylight had been ever increasing. For the first time I could see the suspected antlers. And he was about to move up out of a shallow wash bottom onto the far bank, into the open. Excitement really climbed as I put the .308 back onto the sticks. Except that buck was not there!?! Back to binocular search mode. None of this calmed me down any at all. I found him again. He must have simply walked past that doe, and now he was covered by brush, except for his head. The rifle was against my shoulder again. I disliked my labored breathing which made the reticle dance. By the time he finally made two steps forward, at least 20 minutes must have passed since seeing the first deer. Now the buck’s shoulder was free, and antlers visible in the scope, the moment of truth, time to send a Nosler 150 grain E-Tip. Thanks to the sticks the crosshairs settled down, purposely a little high and into the wind. Then my commitment to it all! Recoil for a moment robs the view. Then I see two deer coming to rest after a quick panic sprint. Looks like nothing is on the ground where the buck had been. The sun has not reached any of us. My slight trembling has increased. I can’t identify what deer I shot at. Doubt floods in … did I miss again? I can’t tell where the buck ran to, if either is the buck I shot at, or if I need to get ready to try again. Oh, wait … one of them is getting sick, wobbly legs. He collapses, kicks up dust uncontrollably. YES! YES! My nerves let go. Shaking mixes with smiles, with thanksgiving, with talking to myself. Deep joy overtakes me. I pull the ear plugs, grab the binoculars again, want to see how the other deer behave. None are in sight, none running. But, oh, more luck. The binos reveal a short section of dirt road, not far at all from my kill. One more measurement – 242 yds to the bush closest to him. I stow the range finder, re-attach the cross sticks, get up and happily walk towards my buck. Only when I arrived there, two does took flight, over the nearest hump and gone. I never did see the fourth deer, the one I had suspected of being a spike. I call mine a 1.5 x2, with one end broken off. Oops, time to remember to take a picture first, then the red work, then a short drag towards the road. All the way walking back to my wheels I could not help smiling, thanking. Also, it became obvious that the best tree to hang him in is in our back yard. Mary was at work, could not offer a difference of opinion. A great way to end a great hunt, with the comforts of home available.